In this era of Globalization when the world has become a Global village we feel that Indian students should get global exposure so that they become abreast of the latest technological development of the world. We strongly believe that International Collaboration has become a key element in globalization strategy. Bhagwant University provides opportunity to students who are ambitious to have an undergraduate / post-graduate degree from foreign university through its unique international tie up programme. The division of Global Outreach has developed relationships with reputed Universities and Colleges around the globe for student and faculty exchange, development programmes and International Internships. 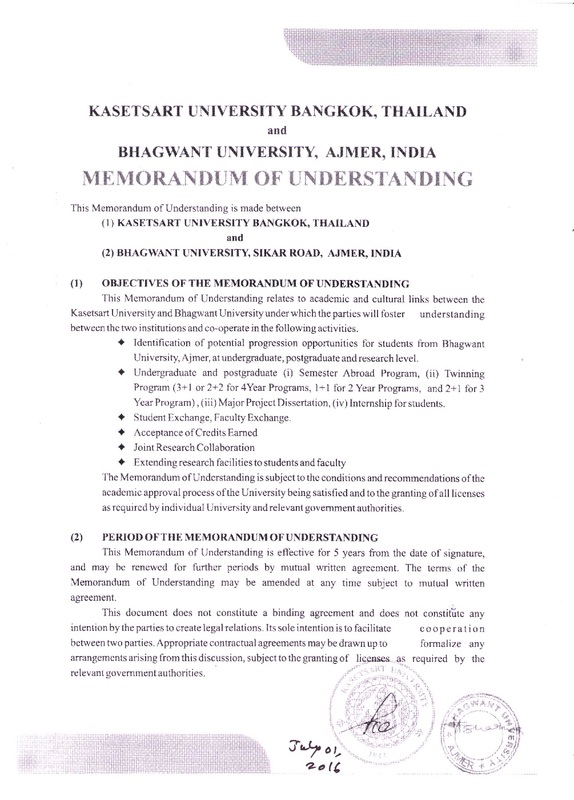 “Twinning/ Transfer Programme” The University has also initiated for “Twinning/ Transfer Programme”. Under this the students would pursue their first two years of a degree programme at Bhagwant University, India and the rest of the program in a foreign university which will award the degree at the successful completion of the programme. The Benefits of such program is that: One can get an international degree, Can have the flexibility to do the first 2 years in India and the remaining two years at any of the listed University abroad., Can transfer credits to any other University including the partner Universities, the foundation course at Bhagwant University is according to the international curriculum. The greatest advantage is that the cost incurred is half of what one would spend when one does the entire undergraduate program abroad.